Thank you for the help! Look this is the last time I'll say anything on the topic. You either drop all the drama between you and Lodatz or we will start banning you every time you bring it up. If what he says is true or lies it does not matter, just leave him alone. I proved he is a liar, I cleared my name. Please man, let it go with Lodatz. Just don't answer or write anything to him let him be. If he mentions you I'll delete it or edit it. Why do I need to stand his abuse? Tell me? I was banned before for doing much less than he, why is he allowed to provoke? Why must I be forced to stand the silent on the low key abuse of the person that openly called me cancer and asked for my account to be erased? I'm not naive I know that he is doing it on purpose after he boiled up so much hate and bitterness for a whole year, but why are you un-willing to tell him to at least, not respond to the topics that the user that he called cancer and asked for his account to be erased opened? At least stop him from spamming my topics, at least give me that, I was banned before I served my time I don't deserve to be treated like a third class user here. I'm not asking you to stand abuse, like I said I'll make sure to delete or edit whatever he says that's provoking or attacking. Again, I can't stop him from commenting on a thread you opened just because. If he's on topic and not breaking any rules he's more than welcomed to do so and you are equally allowed. If I see he is spamming on purpose those will be deleted and I'll issue a warning. Golazo, I must ask you to ignore or avoid such discussion with Lodaz. i saw your report and I have had a word with him. Regarding his history toward you, I dont take side and and have asked him several time to stop. I hope you do too. 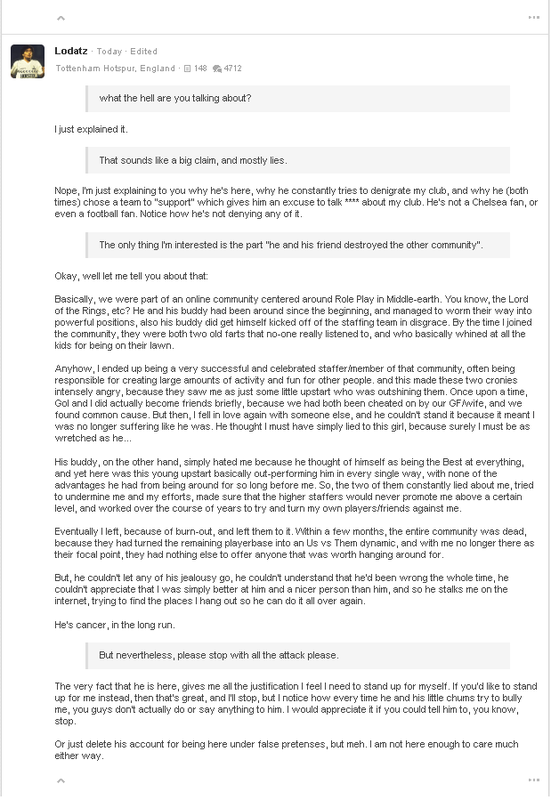 But you can't just let him pass just by having a word with him, do you see that he came to a 1 year old topic, was warned a few times and in the end called me cancer? If it was me or anyone else doing it to anybody, you know very well that it's a ban, so please react properly, you banned me for 4 weeks for much much less, please be righteous and don't treat my case poorly just because you dislike me, do your job and do the right thing. I replied to you in my wall. And explain the different. Btw, plz try to read the other opinion too and avoid repetitive argument. He came to a 1 year old topic full with hate and holding an old grudge, he insulted me multiple times all of which I ignored and then he called me cancer and asked for my account to be erased. That is not just a warning after all the warning he had got prior to that, seriously if you are unable to see that he should be banned for calling another user cancer then I will ask another moderator because you are not treating my case fairly, anyone else would have got a ban after all he did. Go ahead. Talking to you is exhausting. Your way of talking to him were very provocative too, as much as him. You repeat the same innocent statement which is ridiculous. A simple: you spreading lie is enough of a response to him. But like any other thread, talking to you is like talking to a wall, you keep going and talk to your own idea as if the other has not responded to any of your sentence. Where did I lie? I never lied. He insulted 1 year ago, got a warning, came back insulted again, and again, and again...that's 4 warning and then he called me cancer. Why are you not banning him and just looking at me only? Why are you so not willing to be fair towards me? It's an example of how you could say it to him. Im not saying you are spreading lies, I am saying: you should have just told him, you spread lies and reported him. But you went on, ignore and kinda trolled him. If he repeat this again, I will immediately ban him. Hey man, have you planned on creating those squad threads for other teams such as France or Spain? Not really but I can do it if you want or if you prefer you can also do it, as you want. Hey mate, you need to stop bringing up thing that happened in the past and targeting the moderator and be offensive with them. We seriously wasting way too many time dealing with you taking everything too personal and I'm sorry but we don't have the mainpower for that so stop it or else, I'll have to ban you. If you ban me for pointing out that a moderator was insulting and rude, you just prove my point that he can act however he wants and not even get a warning. A moderator should not act so aggressively, I pointed out that other user wrote something similar to me but he didn't jump on him and yet he saw me as an easy target, I was not offensive at all. In case you really think that a moderator should be acting that way and that it's not a personal attack then you are opening the door for anyone to act the same way towards anyone in response to any post. That means that I can say to you exactly the same, that your argument is dumb, that you're just a fanboy and I don't need to say why I think so nor write my own argument about it which leaves us with no real debate nor discussion. @Golazo Mate, I'll have no problem with you as long as you respect the rule, respect the other user and don't taunt other. I know you think your perfectly fine the way you act but personally, I seen plenty of time in the past where you acted the victim despite having provoked other and made yourselve especially frustating to deal with. Nobody like sour bias people who alway repeat the same argument over and over and that can't let the past behind. If you can work on that, then it should be fine. I'm sorry mate but I'm ain't banning anyone because you telling me to do it. Its true tiki shouldn't create another account however, until we moderator come to a decision toward the complain he have, we won't move immediatly against his new one. In other word, be patient and let us deal with us at our own pace. Please stop trying to boss moderation around, its infuriating to work hard and being told what do to by user who simply make demand because of grudge they have with other user. We don't use our power to take side on petty dispute normaly. He was accussing me of having multiple accounts for 6 months with no proof and he got away with it, now he is using multiple accounts and I demand justice. Hey mate, please stop with tiki, I understand what he say about double account isn't nice at all and I disagree with what he say but its not worth getting banned for. I will talk to him, so please don't get into trouble for that. Hey mate, please stop with tiki, I understand what he say about double account isn't nice at all but its not worth getting banned for. I will talk to him, so please don't get into trouble for that. You are all his best friends, enjoy was nice knowing you! Your making an idiot of yourself for no reason. Stop it mate, your better than that. :( Like I said, I told him to stop it. Your making an idiot of yourself for no reason. Stop it mate, your better than that. :( Like I said, I already told him to stop it. Wanna say sorry man for whole discussion on Ancelotti/Heynckes thread. It got you ban but I hope you aren't mad, I respect you since you are one of most active people on site here. Cheers. You have nothing to be sorry for, I deserved what I got. I'm sorry to tell you this but I'm giving you a short ban. The way you have answered Croatian isn't acceptable, its very provoking and only lead to annoying people off which we doesn't want. Use the time off the site to cool your head mate. Hey mate, I modified your pic so it won't stretch as much when its smaller, if you want it, simply download it and replace your current pic in your profile with mine. ;) Hope you don't mind the initiative. Thank you so much man! No, too many depressing fans.